Dinerwood: Los Angeles Diner Reviews: Roady's- Excellent! Now, I'm sure the residents of this little town can fill volumes with the fabulous history of San Dimas, California, but let's explode this bomb first to get it out of the way: we all know San Dimas as the home of Ted Theodore Logan and Bill S. Preston Esquire. 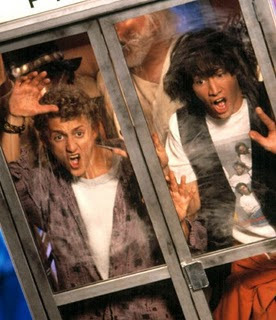 And we all know that San Dimas High School Football rules! Faithful readers, I will now tell you something you didn't know about San Dimas. Located in ridiculously cute downtown San Dimas, there's a little storefront diner called Roady's. I was invited there by legitimate journalist and fellow blogger David Allen. This place was a complete mystery to me. David said he only makes it out there about once a year. It was cute and quaint inside and had a an honest small town feel. It wasn't packed full of kitsch, but there were the obligatory Coca-Cola signs pinned to the wall. I imagine it was originally just the one small shop space with the kitchen, counter and a few booths. At some point, they took over the space next door and outfitted it with some choice wood paneling and pictures of Native Americans on the wall. 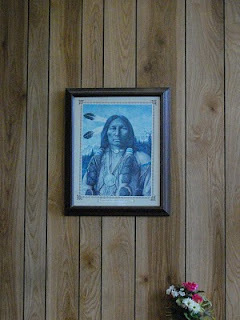 Wood paneling and pictures of Indians? That's the recipe for my childhood home's den. It felt like going back in time and going back to Montana. All it needed was a snooker table, a bison skin hanging on the wall, and a suit of armor. Yeah, I grew up in a weird home. I started off with the coffee and was pleasantly surprised at the quality. They had great coffee. Between our regular waitress and the other gal making the rounds, I never found my mug empty. 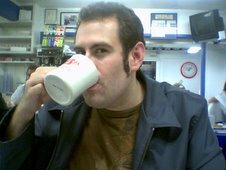 I drank easily six or seven cups. It didn't take too long to make our way through the menu. It's small but covered the basics of what you'd reasonably order here. I had to try the Chuckwagon Breakfast and David went with the patty melt. The Chuckwagon Breakfast had some serious diner food going on. I could tell this meal was going to sit in my stomach and hang out for awhile. The bacon was very crispy--shatter into tiny pieces crispy, which is not normally how I like it, but it still had a good flavor. The sausage was also good. The biscuit wasn't so much a biscuit as a piece of bread with the texture of rustic sourdough. That was different and not necessarily bad. The gravy was interesting. It tasted doughy, not floury. It's an easy difference in flavor to be able to catch when you've eaten as much white gravy as I have. You can tell a pre-mix gravy because it tends to be thinner in consistency and flavor. If it tastes like flour, it is usually because the roux (the fat and flour mixture) wasn't cooked long enough. I believe the dough taste must have been from the fat to flour ratio being off. I like a doughy flavor so this didn't bother me, but your mileage may vary. David got the real winner. It didn't seem like much when it arrived at the table. The sandwich was rather thin for a patty melt, but this really was the key. It was thin like a grilled cheese and this made the bread grill just right and the cheese melt just right and the meat blended in perfectly. It was easily in the top five patty melts I have tried. We then hit the pie course. They had about six to choose from. I went with apple and David ordered the lemon meringue. The lemon meringue was good, but unspectacular. My apple pie was the best slice of apple pie that I have had since Mama Kat's in San Marcos. It was perfect. It burst with flavor and sweetness and the crust was amazing. Overall, Roady's was a very nice experience. It felt like an ideal small town diner, almost too good to be true. It was clean and bright with waitresses who were sweet and engaging. The food averaged out to good. I could see myself going there about once a year, too. Pie: Yes. OMG the apple! Chef's--Stick around, hang out, make friends. Diner on Main: I don't like sports.